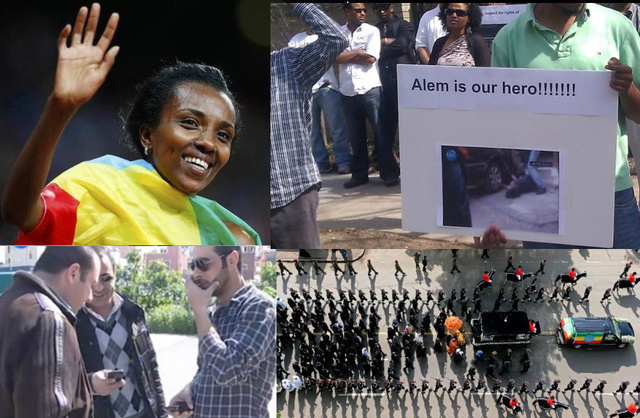 New York (TADIAS) – From the death of former Prime Minister Meles Zenawi to the apparent suicide of Alem Dechasa, and from the surprise results at the London Olympic games to the decisive re-election of President Barack Obama, 2012 has been a year of many lessons and historic transformations. The mysterious absence, illness and death of PM Meles Zenawi was by far the biggest political news of the year in our community. On July 15th the 57-year-old prime minister failed to show up for an African Union meeting that he had religiously attended without absence since the early 90′s. What followed next was several weeks of bizarre secrecy by the Ethiopian government and repeated pronouncements of vague assurances by officials about the status of the PM’s health. Prime Minister Meles Zenawi was eventually declared dead on August 20th and was given a state funeral on September 2nd, 2012 at the Holy Trinity Cathedral in Addis Ababa. The confusing summer frenzy also exposed the weakness of the flummoxed political opposition in the Diaspora as disorganized and fractured, neither inspiring confidence nor prepared for public leadership and responsibility. What was inspiring in 2012, however, was the spectacular performance of our women athletes at the London Olympics. Ethiopia earned seven medals this year, three of them gold, courtesy of Tirunesh Dibaba, Meseret Defar and Tiki Gelana — making the country the leader in Africa on the athletics medal count and globally trailing only the United States, Russia, Jamaica and England. Here are images from some of the biggest stories of 2012.